I have to admit I’ve grown to love and adore Basil. He’s great to work with flavouring my summer salads, ratatouille, and my pesto sauce for my pasta. He’s always on hand outside my kitchen door or in the veg patch, not much looking after needed, baking up the full sun and a little water. I remember basil growing in my grandmothers herb garden, and from a young age picking fresh basil leaves and watching my grandmother make pesto sauce and tomato sauce with basil. Basil is associated with love rituals in some cultures. 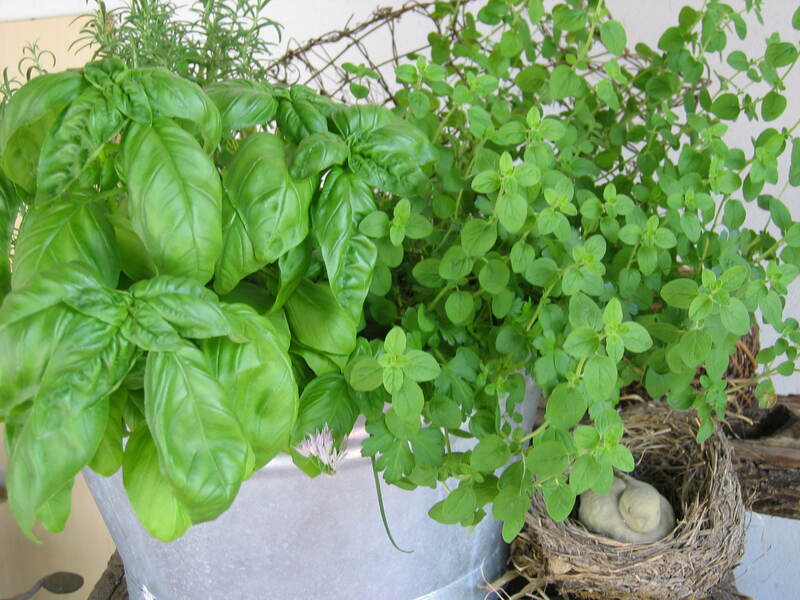 In Italy when a woman placed a pot of basil on her balcony, it meant she would be receptive to her lover. I placed mine outside my kitchen door, so that its only a dash away to add to any dish that I’m making at the time. I’m also not sure about the burning of basil, as noted by Bruce Burnett who is the author of the book – Herbwise:growing cooking wellbeing – a book about the creative use of herbs. There are countless types of basil the most common used in pesto – genovese basil, and sweet basil preferred for cooking. The Italian cuisine is full of many recipes using basil, one of the royals, up there with oregano and rosemary. I don’t always have the time to make my own pesto sauce, but good quality pesto can be found in most gourmet delicatessen’ s, although if you have the opportunity to make your own..try it..your kitchen is filled with a cloud of a divine sweet basil aroma. I’ve said before that Italian style recipes are simple, mainly using 3 or 4 ingredients. These ingredients are the same used in Eggplant flowers. 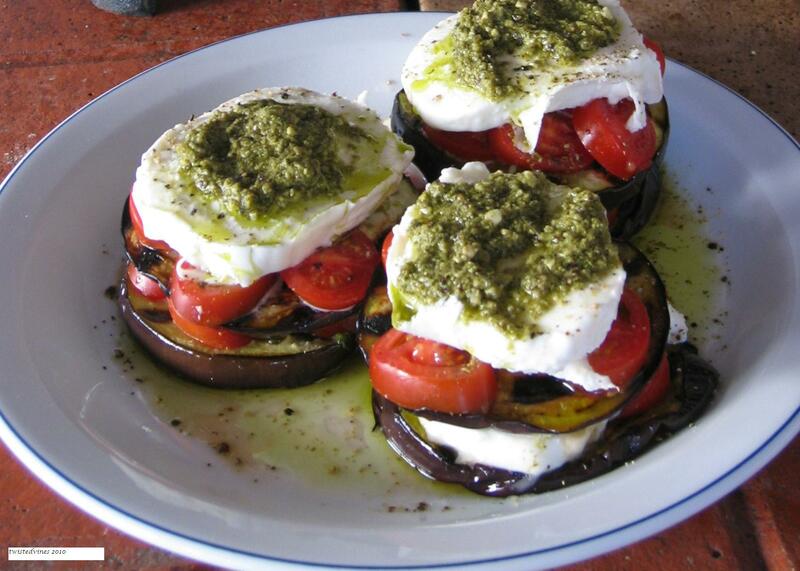 Eggplant, tomatoes, mozzarella and the all important basil pesto. Slice the eggplant into medium size circles, grill on barbeque hot grill, slice cherry tomatoes into circles and also the mozzarella. 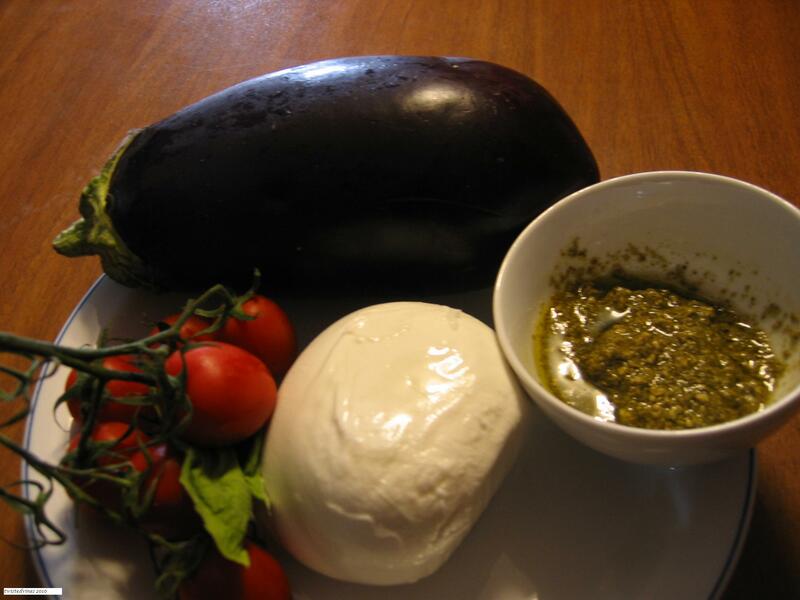 When the eggplant has been grilled on both sides, start stacking…eggplant, tomatoes and mozzarella, doing only two layers. Add the pesto sauce on top in abundance. These are quick and a great eye pleaser, easy entertaining! Serve as a side dish with grills or as an entrée. I am a person who can’t live without basil! Those stakes looks beautiful and sounds delicious. Can’t wait to try it. Oh my, a favourite on my menu….thanks for sharing. Thanks for sharing! Basil is an essential in my kitchen too and it was interesting to learn it’s used as a love ritual!